Forrester: Does My Company Need Web Application Firewalls? When your website is your business, attacks can pose a serious threat to your livelihood. Doing business online, you run the risk of becoming a target to malicious hackers, and that can prove disastrous for your business. 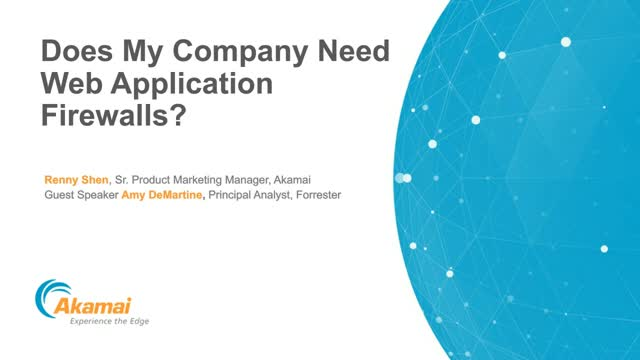 Join Akamai and guest Forrester for this webinar. Increase your knowledge of DDoS and application attacks, with insight from Akamai’s Security Research and Intelligence experts, by listening to this webinar. Who malicious bot developers are trying to attract to evolve their bot evasion techniques. What mental health issues to monitor on your security team to improve wellness. Why up to 45,000 routers exposed 1.7 million machines to attackers. When a DDoS attack isn’t really an attack, and how Akamai experts dug in and diagnosed the real cause of 4 billion unwanted requests to a site. How our experts used two methodologies to gather insight for the State of the Internet / Security report. Attack methods continue to diversify, and the rate of change is faster than ever. The major Internet security events and trends of 2018 point the way toward what to expect in the year ahead and how attacks are likely to evolve. In our upcoming live webinar, learn about the development of brute-force DDoS attacks, phishing, credential stuffing, and other attack vectors, along with the best of Akamai’s research featured in the “2018 State of the Internet / Security: A Year in Review” report. A slow-performing or error-prone website can cost millions in lost revenue. Retailers need to invest in the right tools to be able to monitor and fix website and application performance issues and identify the business impact of performance. In this webinar, Luca Collacciani, Senior Director of Web Experience, EMEA, Akamai Technologies will be interviewing Theodore Hettich, Chief Sales Officer, Fruugo to discover how global online shopping marketplace Fruugo manages rapid global growth whilst maintaining low page load times. While Distributed Denial of Service Attacks (DDoS) attacks are one of the oldest types of threats against websites, they are constantly evolving, making it harder to defend against them. Today, attackers use large armies of automated "bots" to create DDoS attacks on a very large scale. According to Ponemon Institute's recent report on credential stuffing* it's estimated that more than 30% of bot attacks go undetected and an average successful attack can cost upwards of $6M. Retailers are a key target of such attacks with the cost of being offline for even a few hours huge in terms of both lost revenue and also brand reputation. In this webinar, Jay Coley, Senior Director - Security Planning and Strategy, Akamai Technologies will be interviewing Paul Draper, Solutions Architect, Whitbread to learn what security strategies Whitbread implement to ensure that they are always available. Great web and mobile experiences are key to engaging consumers, yet difficult to achieve. To drive engagement and online revenue, it’s critical to optimise performance to meet consumer expectations for consistent, fast, secure experiences. Digital performance management is key to be able to measure, optimise and validate the business impact of web performance strategies and understand the correlation between website performance and business outcomes. In this webinar, Luca Collacciani, Senior Director, Web Experience, EMEA, Akamai Technologies will be interviewing Marc Farrell, Site Performance Specialist, Shop Direct to discover how Shop Direct measure the performance of their website and the different strategies used to improve it. What are the lessons learned from the recent rash of mega-breaches (Equifax, CIA, NSA)? How can you apply these lessons toward educating your workforce and strengthening your organization’s security posture? Online shoppers are browsing and buying more frequently than ever before, and they are doing so from multiple networks, locations, and mobile devices. In this webinar, in partnership with AO.com and Internet Retailing, we will examine the best ways for retailers to optimise and monitor their websites’ customer experience. Akamai’s Chief Strategist of Commerce, Jason Miller, will be joined by Adam Warne, Global IT Director at AO.com, who will be able to share how they have increased conversion rates on mobile devices. Managed to scale their e-commerce platform during peak periods, including when they became the main sponsor for the TV show "Britain’s Got Talent"
The threat landscape for financial institutions has changed considerably since the DDoS attacks of 2012, with credential abuse, account takeover, and fraudulent money movement causing a host of security issues. As a result, asset managers of all sizes need to invest in more controls to reduce this risk. Join this webinar with Rich Bolstridge, Chief Strategist, Financial Services at Akamai Technologies, for an overview of how the definition of “adequate cybersecurity” has shifted. Akamai sees more than two trillion Internet interactions every day and has mitigated malicious attack traffic over 630 Gbps. Our security experts analyze this information and share trends, observations, and findings in the quarterly State of the Internet / Security Report . Join us for an overview of Distributed Denial of Service (DDoS) and web application trends and data gathered from Q1 2017. Providing employees with secure access to enterprise applications deployed behind the firewall is a core requirement for all businesses. Increasingly, enterprises must also deal with the riskier proposition of providing this same access to third parties, including their contractors, partners, suppliers, and customers. Enabling secure application access, whether hosted in a public cloud or private data center, is a complex and cumbersome task. With DDoS cyber attacks rapidly increasing in both size and speed, as well as attacks that are crafted for a specific application or service, it’s never been so critical to ensure your basic availability is sound. Mitigation services can no longer be ‘one size fits all’. Organisations now need a tailored platform for the specific application or service to ensure 100% availability. Without availability ensured then other security overlays are meaningless. This webinar will look at attack trends and case studies and provide top tips on how to stay ‘always on’ in the face of cyber attacks. Akamai sees more than two trillion Internet interactions every day and has mitigated malicious attack traffic over 600 Gbps. Our security experts analyze this information to share trends, observations, and findings in the quarterly State of the Internet / Security Report . Join us for an overview of distributed denial of service (DDoS) and web application trends based on data gathered from Q4 2016. Akamai sees more than 2 trillion Internet interactions every day and mitigates 40 – 50 DDoS attacks every month. Our security experts analyze this information and share trends, observations, and findings in the quarterly State of the Internet Security report. Join this for an overview of what we found after analyzing data from Q3 of 2016. Your consumers are more engaged on mobile devices than ever before. Mobile commerce is up more than 50% globally and retail revenues are 60% greater than this time last year. Online retailers must be more prepared than ever to support a daunting number of connected devices operating on a variety of browsers and networks. Security must go hand-in-hand with performance this holiday season - retail leads the way as the industry most frequently targeted by attackers. In Q4 2015 nearly 60% of all cyber-attacks in North America targeted retail companies, and DDoS attacks were up 129%. With projections suggesting that this holiday season will break last year’s records, maintaining a high-quality user experience will be more challenging and more rewarding than ever before. Join Akamai's eCommerce experts to learn how best to position your business for success this holiday season. Akamai’s threat intelligence is unique because of the depth and breadth of Internet traffic we see on a daily basis. We carry traffic from the 30 largest media organisations, 100 of the world’s largest banks, and 96 of the top 100 online US retailers. This provides visibility into the disposition of both legitimate and malicious traffic around the globe and across industries. We analyse this information and share trends, observations, and findings in the State of the Internet Security report. Join this webinar for an overview of the most important takeaways from our soon-to be released report. Adoption of data-driven security is set to rise threefold in 2016. Benefits include advanced security automation, accuracy and intelligence that enable mitigation capabilities to adapt in real time as threats change. However, solutions will only be as effective as the age, quality and quantity of the data available, meaning access to vast amounts of live attack traffic will be vital. Join us for this webinar to learn more about data-driven security and how it’s being deployed to bolster web defences. DD4BC has targeted many businesses, threatening an attack and demanding Bitcoin payments. Learn about their tactics and techniques, and why Akamai believes that other copycat groups are on the horizon. Title: Forrester: Does My Company Need Web Application Firewalls?